Magellan Midstream Partners (MMP) is one of America’s largest and oldest MLPs and specializes in refined petroleum products. The MLP's pipeline systems are utilized by energy companies such as Marathon, Valero, HollyFrontier, and Phillips 66. Magellan transports products such as gasoline and diesel fuel from refineries, helping them eventually reach gasoline stations, truck stops, airports, and other end users. Magellan owns the longest refined products pipeline system in the country, extending over 9,700 miles from the Gulf Coast and covering more than a dozen states across the central U.S. 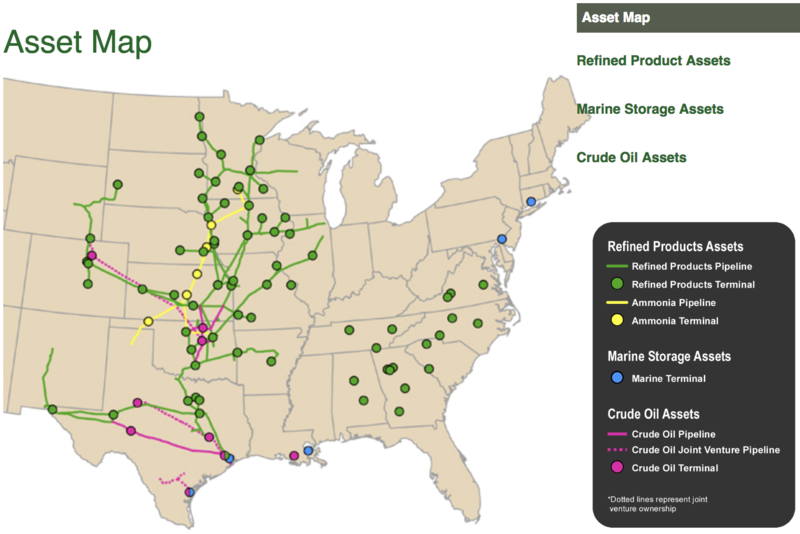 The MLP also owns more than 40 million barrels of storage capacity at 53 connected terminals, over 3,000 miles of ammonia and crude oil pipelines, and six marine storage terminals. 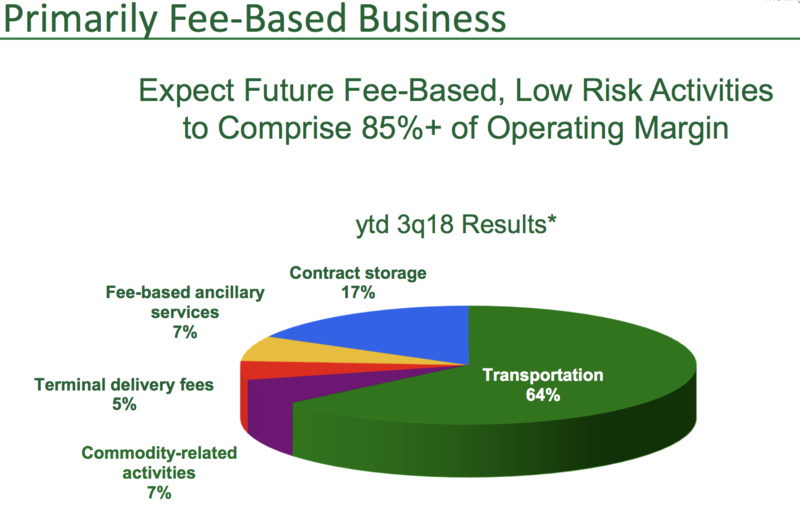 These assets supply Magellan with extremely steady distributable cash flow, or DCF (similar to free cash flow for MLPs), courtesy of the fixed-rate transportation contracts it has that are generally insensitive to commodity prices. In fact, only 7% of Magellan’s operating margin has any direct commodity exposure at all, and management uses hedging to reduce that risk even further. 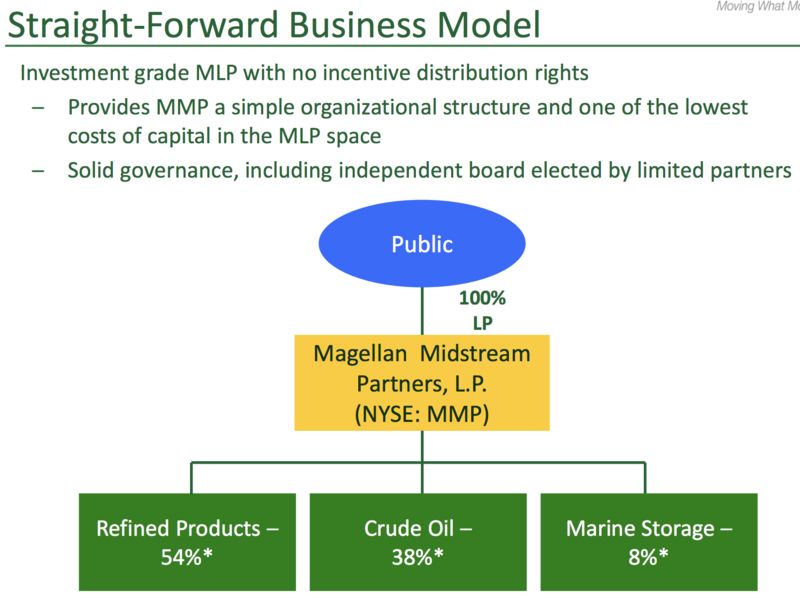 In addition, because 62% of Magellan’s business is in refined products and marine storage, two sectors that often do relatively well when oil prices are low (due to higher demand), the partnership’s business model makes it one of the more resilient MLPs in a low energy price environment. Magellan's cash flow stability and conservative management team have allowed the firm to deliver 17 consecutive years of distribution growth. Operating pipelines is an attractive business for several reasons. First, few companies have the financial capital and industry relationships to compete. Building a new pipeline can cost billions of dollars while taking years to complete (and legal challenges mean sometimes they don't get completed at all). Without connections to oil & gas producers, refineries, and regulators, it’s not possible to run a successful pipeline system either. Each region can only support so many pipelines as well (the refined products market is quite mature), which has resulted in a fairly consolidated market. Additionally, there are few substitutes for pipelines thanks to their cost-efficiency and safety, as well as geographical constraints (oil and gas formations tend to be in hard-to-access areas). Most of the products moved by Magellan’s pipelines are also non-discretionary in nature, resulting in predictable demand patterns and stable cash flow. Despite its tollbooth-like business model, like all energy stocks, Magellan’s sales are cyclical, rising and falling with the price of oil. Revenues will naturally decline when oil prices crash, as they did in 2008-2009 and 2015. However, what investors need to focus on is that because of the way Magellan’s contracts are structured, its margins and returns on invested capital are far less volatile, making the company a dependable income investment over the years. Perhaps most importantly, Magellan’s stable business model and lack of need for equity growth capital (which can be dilutive to existing investors) means that its DCF per unit (which funds, secures, and grows the payout) has been very stable over time. Magellan’s stable DCF is possible in part because of the MLP’s buyout of its general partner back in 2009, at the height of the financial crisis. That proved to be a wise move because it allowed management to acquire its sponsor at fire-sale prices, and it meant that Magellan Midstream was one of the first midstream MLPs to eliminate incentive distribution rights, or IDRs. IDRs give the general partner (the manager and sponsor of the MLP) an increasing percentage of marginal DCF, up to 50% once the distribution climbs high enough. IDRs provide the sponsor with an incentive to drop down (i.e. sell) assets to the MLP in order to grow its DCF, and thus the payout, quickly. However, the downside to IDRs is that they increase an MLP’s cost of capital, since only 50% of a new project’s DCF ends up going to investors. A higher cost of capital means that finding profitable enough growth opportunities, in which DCF per unit grows, becomes harder over time. Equally important is Magellan’s disciplined growth strategy. Specifically, management has chosen to specialize in refined product pipelines because they are a much higher returning business than regular natural gas and oil pipelines. The company now boasts the longest refined products pipeline system in the country and can access nearly 50% of U.S. refining capacity, making it an attractive partner for its customers. Thanks to relatively flat demand growth in refined products, there is virtually no competition for Magellan's system, with rivals unwilling to commit the time or vast capital necessary to recreate its network. A portion of the refined products moving through the firm's network are also regulated by FERC. Due to the regulated nature of the transportation tariffs it can charge, Magellan doesn't risk losing market share because customers know they are getting a fair deal. However, because demand for gas, diesel, and jet fuel isn't increasing much in America, this core high-margin business isn't a good long-term growth driver. This is why Magellan has spent the last decade (and about $5.5 billion) diversifying into marine storage and most recently, crude pipelines. As with all of its investments across the business, Magellan will continue targeting a strong 6-8x EBITDA multiple to ensure a healthy return. However, more of the firm's incremental growth will come from serving America's booming shale oil production, especially in the Permian Basin, where roughly a third of total U.S. oil production is generated, according to Time and the U.S. Department of Energy. U.S. shale oil production is expected to continue growing through the late 2020s. When combined with about strong growth in U.S. natural gas production, the Interstate Natural Gas Association of America estimates that by 2035 the U.S. might need nearly $800 billion in new midstream infrastructure, with about half of that going to oil pipelines and export capacity. Simply put, Magellan is potentially well situated to keep its growth backlog well stocked with profitable projects for at least the next decade, which would mean steady growth in DCF and its generous distribution. Speaking of the MLP's payout, Magellan has long offered one of the most secure distributions in the industry. Part of the firm's attractive profile is due to it being one of the first MLP's to adopt a self-funding business model. Other than its equity-based 2010 buyout of its IDRs, Magellan has financed its growth entirely with retained cash flow and modest amounts of low-cost debt. In other words, the company's growth plans are detached from the unpredictable volatility of the stock market since Magellan does not need to issue equity. Besides average a healthy 1.2 distribution coverage ratio (DCF / distributions), the MLP's payout and risk profile is further strengthened by management's commitment to maintaining one of the safest balance sheets in the industry. Magellan has a firm policy of never exceeding a debt / EBITDA (leverage ratio) of 4.0 and has stayed below this threshold for more than a decade, for example. As a result, Magellan is tied for the highest credit rating in the industry (BBB+) and enjoys relatively low borrowing costs. Going forward, Magellan plans to maintain a leverage ratio well under its self-imposed 4.0 limit. The firm also plans to maintain at least a 1.2 coverage ratio that has allowed it to deliver strong and consistent payout growth to investors in all economic, industry, and interest rates environments. Overall, Magellan is arguably one of the best run and most conservative MLPs in America, with a great management team, strong balance sheet, and proven track record of generating safe income. With a solid potential growth runway and a low-risk, self-funding business model, Magellan appears to be a quality choice for conservative income investors who are comfortable with its risk profile. While Magellan's track record of delivering reliable income is excellent, investors need to understand that its contract profile, which underpins its relatively commodity-insensitive cash flow, is not as strong as some other blue-chip MLPs. While many MLPs aim for very long-term (10 to 20 years) and volume committed contracts, only 40% of Magellan's refined products shipments are subject to payment, volume, or term commitments with customers, and only for an average remaining life of three years. That's not necessarily unsafe, because its advantages in that business (due to high barriers to entry and a lack of competition) mean that customers almost always renew their contracts, and the utility-like nature of its operations generate highly stable cash flow no matter what the economy is doing. Magellan's marine storage terminals have volume commitments and fixed-rates as well, but these agreements are typically just three years in duration as well. As a result, this business is potentially exposed to greater cash flow variability depending on how market oil storage rates are trading when contracts expire. The firm's crude oil pipelines also don't have strong contract coverage, because Magellan usually only uses long-term contracts for new projects in order to ensure it earns a good return on capital. In 2018, about 40% of shipments on its crude oil pipelines were subject to long-term agreements, with an average life of five years. And while 80% of Magellan's crude oil storage available for contract was under agreements, the average remaining life of these contracts was just two years. Shorter-term deals can create some headwinds, depending on prevailing market conditions when contracts come up for renewal. For example, Magellan's Permian pipelines are contracted at market rates, which fell by 23% when the firm renegotiated 50% of its Longhorn pipeline capacity in the third quarter of 2018. This is part of the reason why Magellan reported weaker than expected DCF growth guidance for 2019. 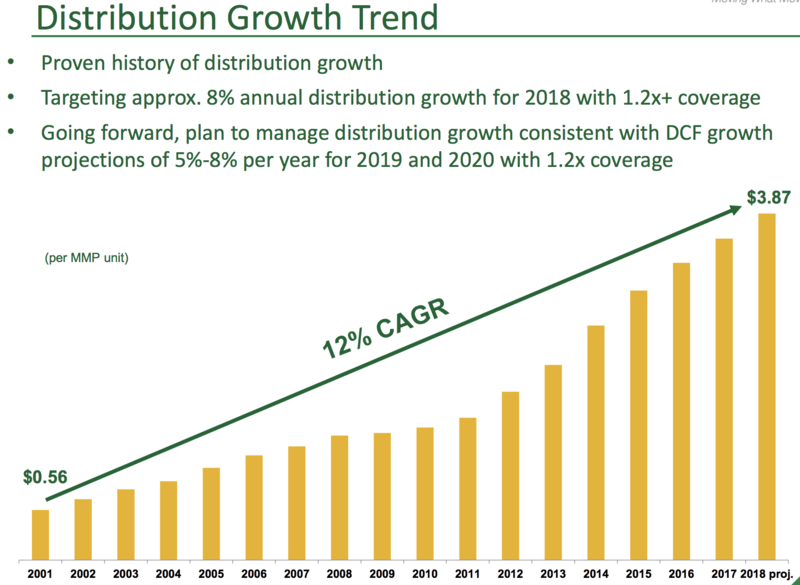 Magellan had previously guided for 5% to 8% DCF growth in 2019 and 2020 and payout growth of the same. It's now guiding for 5% DCF growth in 2019 and said it does "not intend to provide financial guidance beyond 2019" (including for distribution growth). That's due to a combination of factors, but mostly because management is often highly conservative and assumes below full utilization on its expanded pipelines. Should it hit peak capacity (as it's been doing in recent years), then the MLP will likely achieve 8% DCF growth in 2019. Similarly, the growth projects coming online in 2019 and 2020 could help Magellan get close to its previous 5% to 8% cash flow and payout growth target. However, that pace would still be far slower than what the MLP has delivered in the past. Magellan's focus on organic growth and only the most profitable projects means it will face naturally slowing growth rates due to its larger size. That canceled standalone Permian pipeline represents an unusual departure for Magellan. Normally the firm participates in joint ventures and only after a pipeline has received contracts for its capacity before construction begins. In this case, Magellan tried to go it alone and started construction "on spec" (before obtaining contracts), and it didn't work out for investors. While this project was immaterial to Magellan's overall risk profile, it highlights the fact that even well-run MLPs sometimes make mistakes which can result in cash flow and distribution growth not achieving expectations. Finally, investors should note that Magellan Midstream Partners, as an MLP, issues K-1 tax forms instead of 1099s. Owning the stock results in greater tax complexity, including potential headaches when held in tax-deferred accounts such as IRAs or 401(k)s.
Magellan Midstream Partners typically trades at a valuation premium compared to its MLP peers, and or good reason. The partnership’s disciplined management team, industry-leading balance sheet, impressive payout security, relatively low cost of capital, and solid long-term growth prospects make it one of the few compelling MLPs for conservative income investors to consider. That being said, while Magellan's generous payout is one of the safest in the industry, investors have to remember that Magellan's increasing size and low-risk business model will likely mean slower distribution growth than in the past (around 5-8% per year compared to 11% over the last decade). Thus you need to have realistic expectations about owning this MLP and be comfortable with the added tax complexity that MMP's K-1 tax form represents.